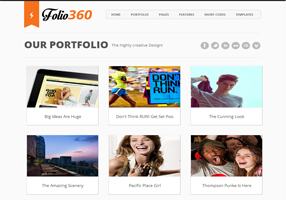 Folio360 is a “Heavy Duty” theme designed for Designers who loves to show off their portfolio. It is truly a powerful, highly flexible and customizable theme which will indeed help you to grow. This theme is perfect for Wallpaper and pictorial based websites. It has lots of striking and incredible features which would impress you and your visitors too. It has clean and sleek design which is considered as the basic need of a portfolio template.